So my 2010 Puma has just turned 80K, and I’m thinking about hitting her up with the old one shot grease in the swivels. Assuming that there is already grease in there at the mo and not oil , am I okay to bung another slug in or do I have to hook the old shizzle out. Unless you have any reason for concern I would just new on top of old. At 80K the Grease owes you nothing...its job is done. container) and then give the swivels a complete new one shot (the correct measured amount) each side. Around £18-£20 in total from LR / <£10 form anywhere else. if its not mixed with the axle oil good luck draining it if its cold. best do it after a run. And as mentioned it’s thin, but not thin enough to be an easy job. I submerge my sachets in a jug of near boiling water for a while before I use it. That makes it a lot thinner. Another good trick is to put a drinking straw, or similar, in the hole so it can allow air out as you fill. Hi, apologies for the noob question but I'm new to Defenders. Background first: I have a 2007 90 with 56,000 miles and I've just changed the axle oils and fitted mag plugs. For the swivel pins, Haynes manual tells me to drain the oil and refill with EP90. Picture shows where the filler and drains are. Trouble is I have a filler and no drain that I can find. Inspecting the filler and it looks like there's moly grease in there and not oil. The residue around the outside of the swivel pins looks like grease to me. Manual does states later models have the grease for life swivel pins that this thread talks about. Thing is, I've got a 2007. Question is: can I just top up with moly safe in the knowledge I have no drain plug? It is possible the axle has been replaced for a later model one I guess (my truck was a structural write off after having a front ender!). A 07 def will only have filler plug, no drain and use one shot grease. 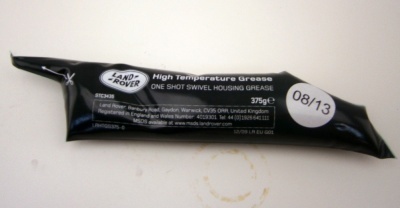 So you either strip it all down remove all grease and start from fresh, or, just stick a tube of grease, or half a tube of one shot grease on top of what you’ve already got. I stick one tube in when I got vehicle and then put half, so one tube for the axle, each yearly major service after that. If you over grease the swivels it just ends up going into the diff oil, which I don’t consider to be a problem. I’m sure others do different. Thanks Landy Andy. I needed that re-assurance given the unspecific mention in the Haynes manual as I wouldn't have consider a 2007 to be a "later model" puma! One tube of moly coming up! Td5’s and Tdci’s don’t have the drain hole. I’m not sure of the date it stopped, but knowing LR it won’t be that exact anyway.